100 Blown Highlights: Day 77, Learning 77: Damnable Lips! Lips, those succulent provocateurs. They can be, they are; or they can be a miserable chapped mess. Next to eyes, they are probably the most important feature of a portrait. Chapped lips, of course, are natural in real life-- the result of dehydration or weather. The challenge they pose for image retouching is in maintaining a sense of gloss and glow. Here's one technique. First, you'll need a pair of lips. Not your own. These were in pretty good shape-- certainly fine for daily life, but at 100% on your screen (a situation we probably should never subject any body part to), they take on an altogether unnatural aspect. Here's what to do. First, make sure they are in the best shape they can be. Clean up the make-up line and clone out any obvious specks and bumps. Second, create two more layers for frequency separation. The middle layer you'll apply a Gaussian blur. Unlike normal frequency separation where you want to have the least amount of blur possible, here you want it to be thick. For this I used 6. Next, perform Apply Image on your top layer, just as you would for Frequency Separation. Don't forget to select the Gaussian Blur layer, and Subtract mode (for 8 bit images). 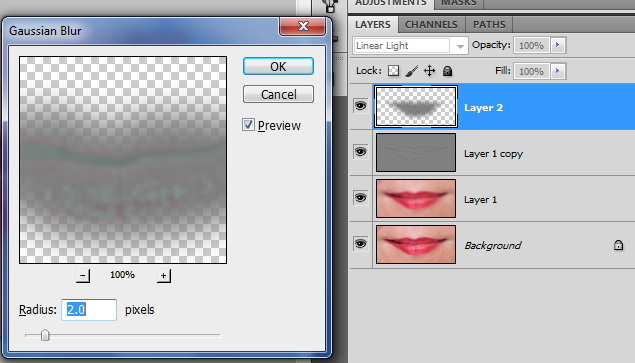 Using your Lasso Tool, select just the lips in the top layer. You'll want to feather this selection a little (around 5). 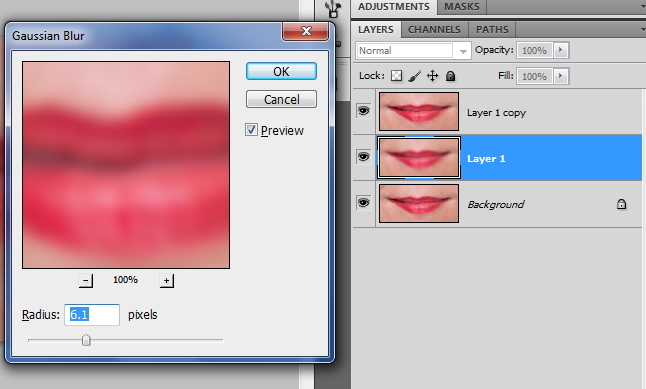 Hit Ctrl J to duplicate the lips onto their own layer. Your lips will look very ugly at this point. On your new top layer, apply a Gaussian Blur, only this time use exactly 1/3rd the amount as before. In my case, 2. Invert the layer by hitting Ctrl I. You should have soft, glowing lips. Now you can bring back detail by lowering the opacity to taste.